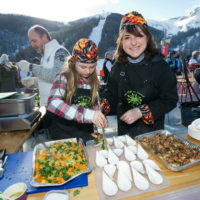 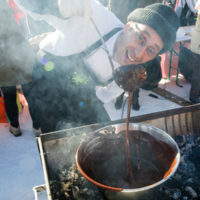 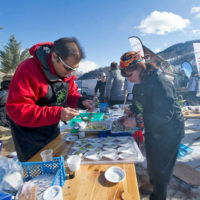 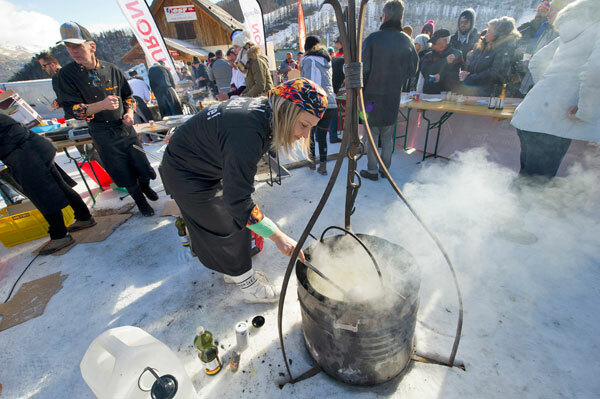 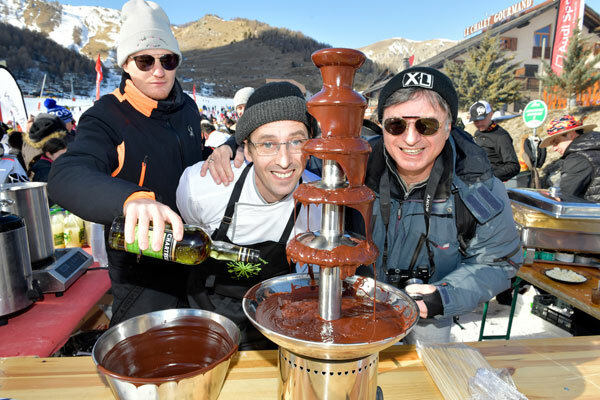 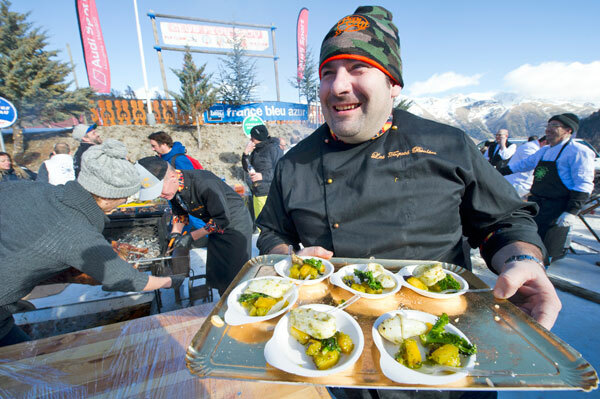 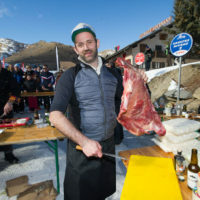 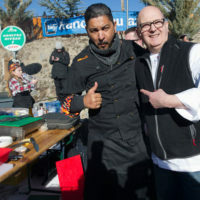 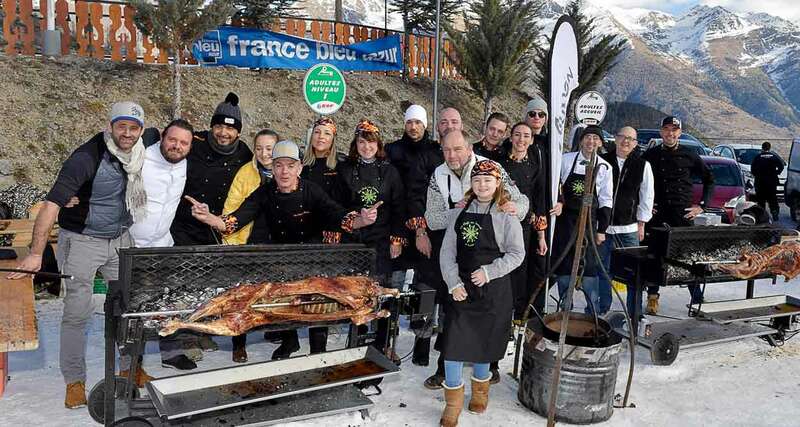 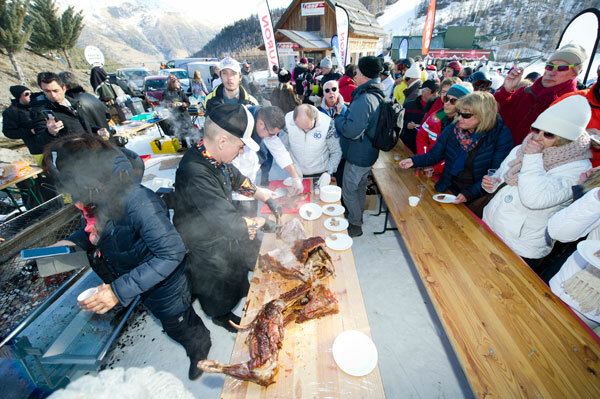 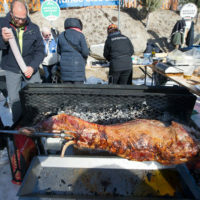 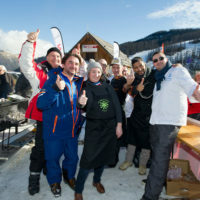 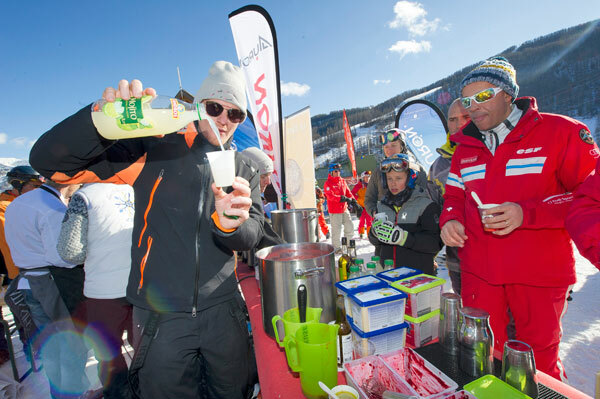 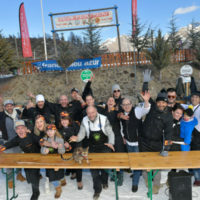 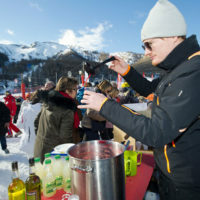 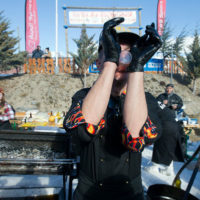 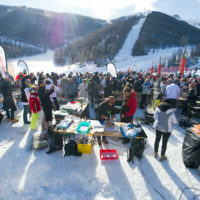 The Chefs au Sommet d’Auron 2019 have donned the Toques Brûlées outfit to offer tourists a demonstration of their culinary skills while treating them to the best delicacies and mountain specialties. 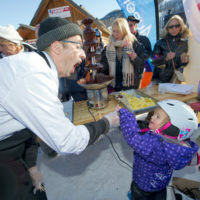 Under the flamboyant outfit of Toques Brûlées, happily animated by chef David Faure from SensÔriel in Nice, the Chefs au Sommet d’Auron offered more than three hours of gourmand happiness to the skiers and skaters, tourists and inhabitants of Auron, by animating with their giant barbecues a Culinary Art show of rare intensity. 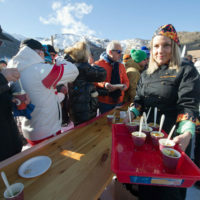 Tastings of recipes “faites minute”, specialties simmered with the warmth of embers of friendship and generosity, were endlessly distributed to an enchanted audience. 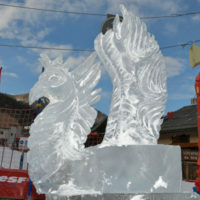 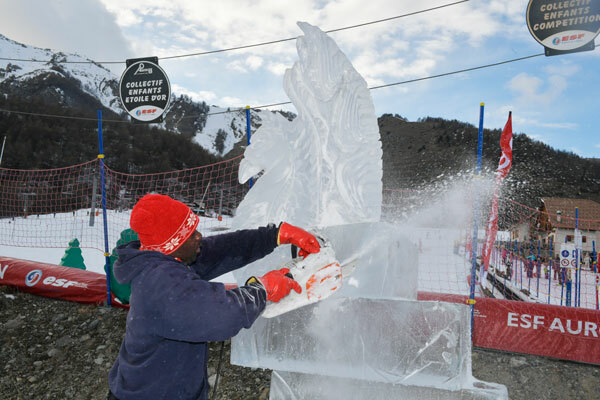 The three-time world champion of ice sculpture Mario Amégée broke the ice by sculpting crystal shapes to immortalize the moment. 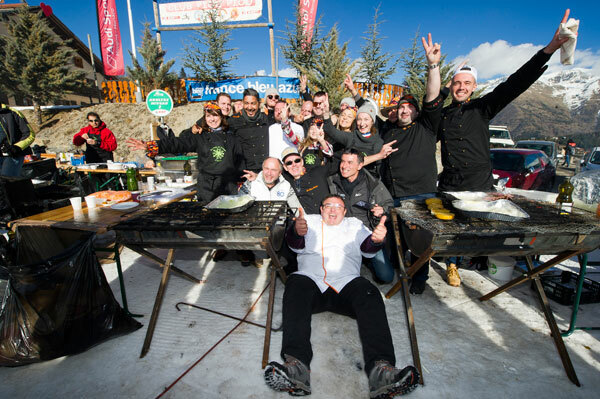 Gastronomy leaves extraordinary memories! 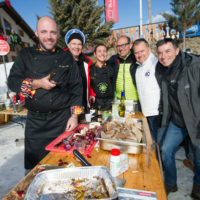 So, the time spent tasting the many specialties prepared by the generous chefs of the truculent Toques Brûlées will have left a memorable taste imprint to mark the 2019 Festival of Mountain Gastronomy, the inevitable Chefs au Sommet d’Auron. 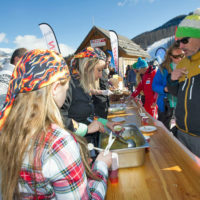 Under a radiant sun, the Locavore of Toques Brûlées, lovingly cooked by the joyous and spectacular brigade and their “chef” David Faure delighted visitors and their families. 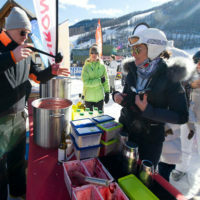 Each cheffe or chef proposed their finest and refined recipe, elaborated at the foot of the snow front and slopes. 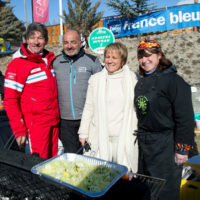 So many delicate specialties: Organic mountain vegetable pot-cooked soup from Agnés Babone by Nöelle Faure; Laurence Dupertuy: Tombée of Kale Cabbage, Daurade Curry Thyme lemon; Nicolas Leclair: Squash from Nice with cezame oil and herb pistou; David Faure: Asian-style pickled chicken fillet and barbecue roast lamb; David Graziani: Head of Squid with Curry, Onion and Roasted Squash; Déborah Georges: Brochettes of half-baked Sea Bream with flattened Cabbage; Toques Brûlées: marinated Game in barbecue, Grilled deer, Spare Ribs lacquered with Soya, Grilled Fawn, Polenta; Redouane Mansouri: Sariole of 8 kg in barbecue, Thyme lemon and Fennel Oil; Julien Matteo: Squash Ice cream with beer and Squid with marine pistou. 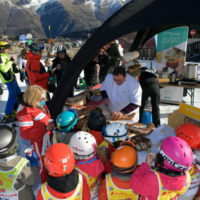 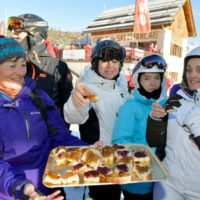 The Toques Brûlées’ refined dishes were accompanied by country breads from artisan bakers such as the Boulangerie Centrale in Saint Etienne de Tinée, the Maison Yalex in Isola Village, the Pains de Flo in Auron and Rolfo Créations in Saint Laurent du Var. 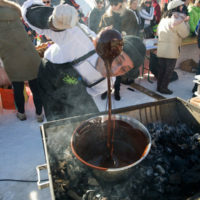 Sweets delighted the taste buds of a public whose appetite was whetted by the fragrant fumes floating around, eager to enjoy the wonders offered by the Chefs au Sommet d’Auron. 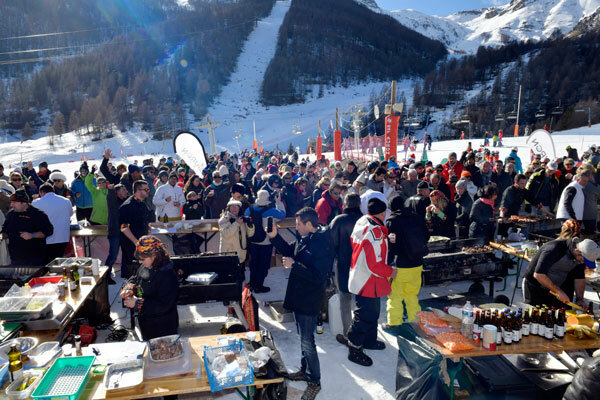 Many reasons to stay in front of the buffets rather than go down the slopes! 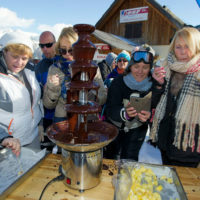 For sweets, Bruno Laffargue from Micmac Macarons had installed a chocolate fountain for a Pineapple and Banana Fondue. 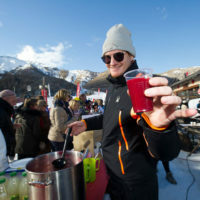 As for drinks, Victor Delpierre, World Champion of Barista/Cocktails, had elaborated a delicious Red Fruit and Violet cocktail. 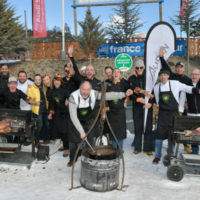 The Toques Brûlées brings together in its association renowned chefs regularly performing on the Côte d’Azur – like at the Etoiles de Mougins gastronomic festival – in breathtaking culinary shows that are true gourmet adventures. 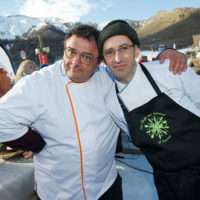 In their modernity and prodigality, the truculent chefs preach creativity, quality, friendliness and friendship. 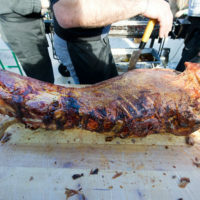 They like to revisit traditional or local cuisine in a modern and evolving kitchen. 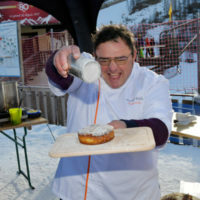 The Toques Brûlées was created in 2007 by their current president, the dazzling chef David Faure. 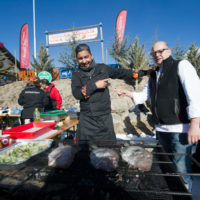 With the snowfields in the sumptuous, pristine peaks of the Mercantour as a backdrop, the Chefs au Sommet d’Auron is a highly mountainous and gustatory event in Auron, Saint Etienne de Tinée and Saint Dalmas Le Salvage. 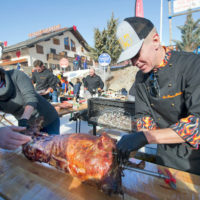 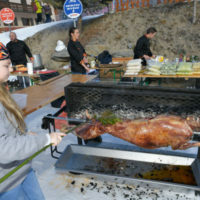 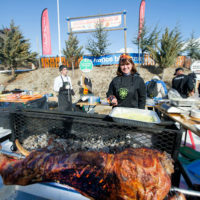 For eight years, the Festival of Mountain Gastronomy has been offering gourmet menus at unique and moderate price (45 €) in the restaurants of the resort and its surroundings. 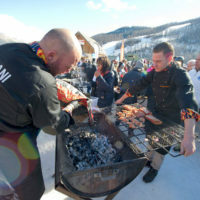 Many culinary demonstrations led by renowned chefs also enliven the gourmets’ afternoon. 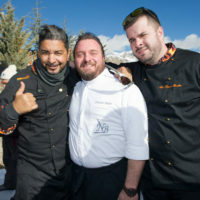 This very “toquée” team, surrounded by pastry chefs of the Côte d’Azur, offers a moment of authenticity, sharing, culinary pleasures and conviviality with the many holidaymakers frequenting the Auron resort.